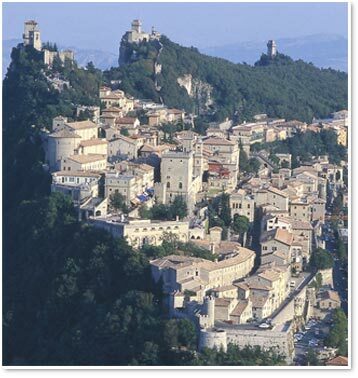 The Most Serene Republic of San Marino, one the smallest republics in the world, is situated in the Emilia-Romagna region in Italy, south of the city of Rimini on the northern part of the Adriatic coast. Its topography is dominated by the Apennines mountain range, and it has a rugged terrain. The highest point in the country, Monte Titano, is situated at 749 meters above sea level. The climate is Mediterranean, with warm summers and mild winters. for live feed of the historic country.